The two-way investments have already crossed the $30 billion target and now the countries are aiming for $50 billion by 2025. External Affairs Minister Sushma Swaraj and Russian Deputy PM Yuri Borisov in Moscow. India attaches "highest importance" to its relations with Russia, External Affairs Minister Sushma Swaraj today said, as she conducted a comprehensive review of bilateral ties ahead of President Vladimir Putin's visit to New Delhi early next month. 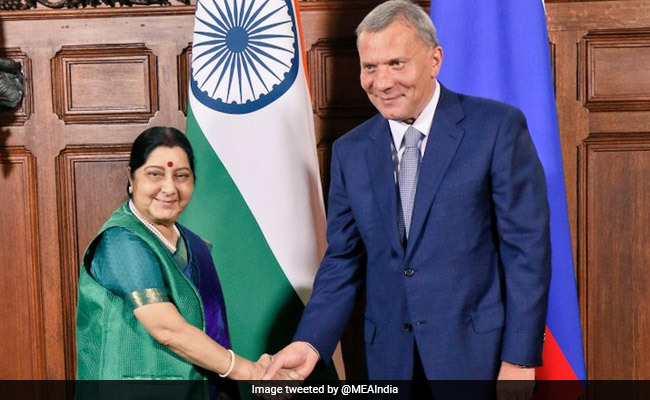 Ms Swaraj, who is on her third visit to Russia in 11 months, held extensive discussions with Russian deputy prime minister Yuri Borisov on ways to boost cooperation in the areas of civil nuclear energy, banking, trade, pharmaceuticals, tourism and space. "This partnership has strengthened over time and covers a vast agenda involving almost all sphere of human activity. India attaches the highest importance to its relations with Russia," Ms Swaraj said after co-chairing the 23rd India-Russia Inter-Governmental Commission on Trade, Economic, Scientific Technical and Cultural Cooperation (IRIGC-TEC) with Mr Borisov. Her comments came over a week after she and Defence Minister Nirmala Sitharaman held "two-plus-two" talks with US secretary of state Mike Pompeo and defence secretary James Mattis during which they decided to further boost bilateral strategic partnership. Mr Putin is visiting New Delhi for the annual summit talks with Prime Minister Narendra Modi, and official sources said Ms Swaraj and Mr Borisov prepared ground for the summit. Ms Swaraj held talks with her Russian counterpart Sergey Lavrov on Thursday during which they deliberated on how both sides are going to cooperate in the wake of a certain scenario that may emerge when the US sanctions on import of crude oil from Iran come into force on November 4, sources said. In talks with Mr Borisov, Ms Swaraj also referred to the trade deficit, which is in Russia favour, and sought more exports from India to Russia including of polished diamonds. The two sides also agreed to expand cooperation in the pharmaceutical sector which included setting up of joint venture projects in Russia. During discussions on connectivity projects, Mr Swaraj conveyed India's strong commitment to the International North-South Transport Corridor (INSTC), linking India, Iran and Russia and several other central Asian countries, the sources said. "The Deputy Prime Minister and I have conducted a comprehensive review of our relations. I am satisfied with the outcomes of our meeting," Mr Swaraj said after the meeting. "I am confident that our deliberations today will further strengthen our cooperation with Russia in all fields in existing and new areas of cooperation," the minister said. The two sides discussed ways to enhance bilateral trade which in 2017 reached $10.17 billion. "We discussed ways and means to increase this momentum, ensure balanced trade, and remove barriers to trade. "Two-way investments have already crossed the $30 billion target, which we had set for 2025. We have therefore proposed that we enhance this figure to $50 billion by 2025," she said. Ms Swaraj said both sides also discussed the possibilities of working together on projects in third countries. "As a new dimension of our strategic partnership, there has been a significant expansion in our cultural and tourism exchanges," she said. Russia and India are on track to bring the trade turnover to $30 billion in the coming years, Mr Borisov said. "Over the past years bilateral trade has reached solid growth rates, which if maintained will help us hit the target of $30 billion in the coming years," Mr Borisov was quoted as saying by Russia's state-run Tass news agency. He also underlined the need to put in more efforts to achieve a "breakthrough" in enhancing the trade. Ms Swaraj noted that an Indian festival covering 22 cities over a six month period is currently underway in Russia. Tourism flows in both directions and has shown impressive growth, she said. India and Russia are working further on liberalising visa regulations on both sides, Ms Swaraj said as she welcomed the initiative of the Russian government to enable electronic visas for Indian nationals visiting the Russia far East. "We have identified new areas of cooperation such as agriculture, infrastructure, transport and Science and Technology. We would like to expand our cooperation in the area of space. "We have agreed to organise the first ever India-Russia Business Summit involving major companies from both sides in early October in India," Ms Swaraj added. The sources said the two sides also agreed on collaboration between Indian and Russian museums as well as expanding cooperation in areas of science and technology. The two sides also discussed new areas of cooperation. The IRIGC-TEC is a standing body which annually meets and reviews ongoing activities of bilateral cooperation in the fields of bilateral trade and investment, science and technology, culture and other issues of mutual interest. The last meeting of IRIGC-TEC was held in New Delhi in December, 2017.